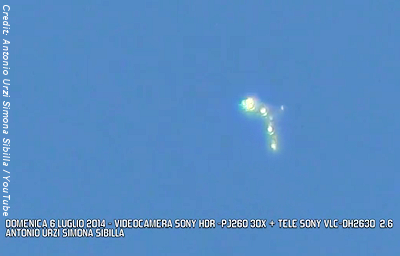 (MILAN) — Was it a bird, plane, weather balloon or visitor from another galaxy far, far away? It was a cloudless day Sunday July 6 over Milan and when Antonio Urzi Simona Sibilla spotted that wild thing in the sky, he wasted no time. He grabbed his trusty Canon EOS 60D and got that bad boy all on video for posterity. Interestingly perhaps, unlike the standard UFO fare of just some bright light in the sky – which means nothing other than a bright light in the sky – this thing appears to actually have some super structure to it. . . .